insures Florida residents, businesses, and commercial property. Blue Sky Insurance® is an insurance agency located in Boca Raton, Florida. Our growth and client satisfaction are due to the dedication of our brokers and agents to comprehensive research, resourceful problem solving, quality insurance products, and superior client service. 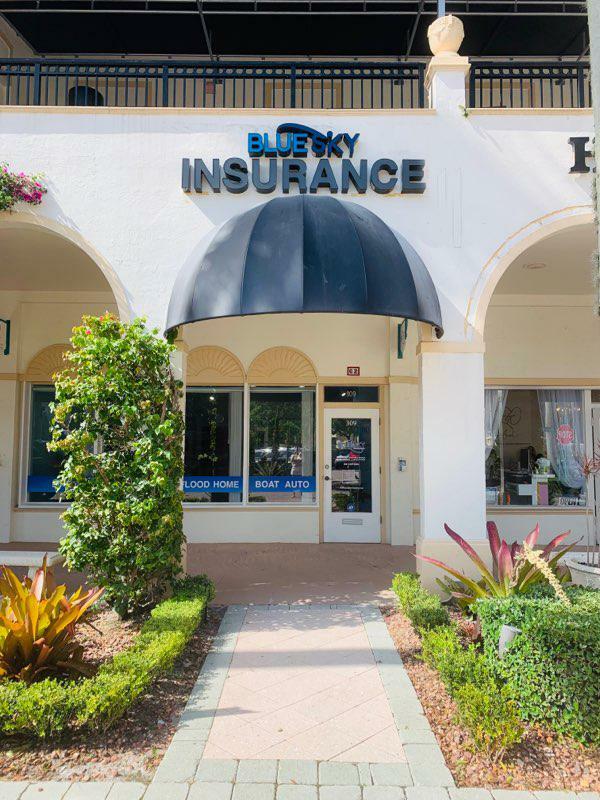 Our dedication to building a supportive relationship and a proactive approach to advising and educating our clients truly separates Blue Sky Insurance, an independent insurance agency, from most insurance brokers in Boca Raton. Visit our offices In Mizner Park in East Boca Raton near the Palmetto Park Road. Our client services include an impartial assessment of benefit plans, a resource for statutory issues, renewal assessments, and ongoing support for enrollment, billing, administration and claim issues. We offer auto insurance coverage and personal Florida insurance coverage for home, life, health, boat, long term care and disability insurance policies as wll as insurance coverage for Florida commercial auto, commercial property, Florida employee benefits, Florida restaurant insurance, umbrella insurance coverage, Florida worker's compensation insurance and a host of other types of commercial and personal insurance policies. Our Florida insurance agency and its licensed brokers and agents stay current with all Florida legislation and regulations, the geographic implications, and the risks inherent to this area to better serve your interests. We place all lines of insurance: personal, business, commercial, Florida employee benefits packages life and health. We are able to place coverage for almost any risk you may have. We encourage clients to call us when service is needed, be it a claim, billing or coverage issue. Our staff is trained to relieve you of these burdens and resolve outstanding issues promptly. Our vision is to be the best at providing our clients with local and complete representation for their insurance needs. We earn our success because of our dedication to service. Our service is our differentiator and our greatest strength. As your insurance representative, it is imperative that we are actively involved in industry trends, changes and issues. The brokers and agents at Boca Raton's Blue Sky Insurance agency uses this information to meet the needs of individuals and businesses. We understand that insurance is an investment in asset protection. An insurance policy is designed to protect assets from a significant loss or liability suit, which would otherwise cause a substantial financial loss, emotional distress and economic ruin.